Don't miss the fact that these pieces are practical too, offering an excellent transition from late Summer to Fall, whether it's fashion for your workplace, weekends, or drinks on the town. Erdem Has there ever been a prettier pantsuit than this one in a rich shade of merlot with a sprinkling of rose petals? 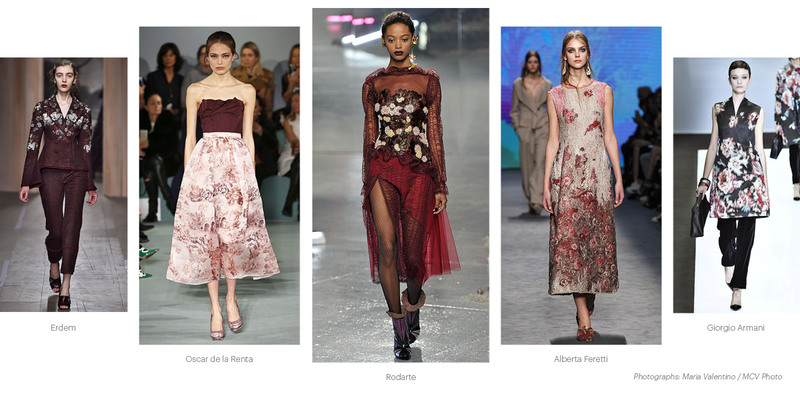 Oscar de la Renta Delicate faded roses contrast beautifully with deep burgundy in Peter Copping's romantic design. Rodarte Floral embroidery graces the bodice of a dress fit for a princess. The sheer illusion neckline and sleeves leave a little something to the imagination. Alberta Feretti The subtle floral brocade on this regal sheath evokes a medieval tapestry. Armani A decidedly modern take on the trend: Abstract blossoms adorn an A-line tunic worn with narrow velvet trousers. Feminine but not girlie: What a wonderful way to flaunt florals while maintaining our womanly mystery! This Alice + Olivia maxi dress with champagne-pink blooms and gray on black takes our vote for a Summer showing -- and when Fall comes, you'll add a cardigan like the Ann Taylor in tea rose shade or a jacket like the Bagatelle in burgundy. Same goes for the cranberry-florals Lela Rose dress (with sleeves, hurrah!). It's perfect for both seasons. Mix with flare: The ultra-feminine silk top from Elizabeth and James (this off-the-shoulder trend shows no signs of fading) pairs well with jeans or a maxi skirt. Just think of the possibilities of this Maje skirt and its fantastic hombre design, or the merlot-colored leather leggings from Neiman Marcus (at a tempting price point). Savor the fruit-of-the-vine shades: We are seriously swooning over the varietal shades we see in not just the dresses, blouses and pants but the accessories too. Check out the Jimmy Choo pumps, the Joie booties, the Barneys New York sandals. But most of all, we dare you to turn your back on the lure of this Fendi Baguette micro-bag with crystal floral appliques. How that garden does grow!